It was a relatively easy install once we knew where we were going to put it. Two sets of the 90 degree angle fittings were used. A BE90 and an SDF34 fit quite nicely in this space. I installed the bypass with 51,118 miles on the engine and 15,000 of those 51,000 miles were with AMSOIL 5W-30. I use AMSOIL Series 2000 0W-30 with the bypass and have gone almost 5,000 miles with no problem. 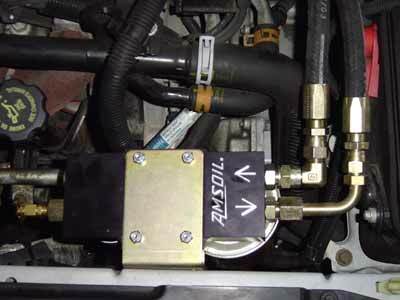 The bypass kit increased oil capacity from 4 qts. to 5.5 qts. and put the oil filters in a much better position to change. We look forward to using this car for several years and based on others results, we expect over, 200,000 miles of life on this one. This makes the Chevrolet Cavalier even more economical!